RUSSIAN/AMERICAN ART- Since 1978 we’ve worked to provide our collectors with great paintings from America, Europe and since 1995, Russia. We had our first Russian show in 1995 and can still visit a few of those first sales in collector’s homes. 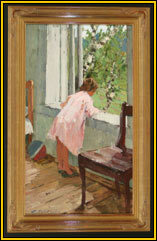 Today our inventory includes key members of the Russian Academy of Fine Arts and other key Russian painters. These include Efrem Zverkov, Anatoly Levitin, Aleksei Sokolov, Vasili Sokolov, Nikolai Galakhov, Elena Tabakova, Nikita Fomin, Yuri Dykov, Eugeni Khoroshilov and Mikhal Likhachev. AMERICAN FOLK ART- Steve is the Vice-chair of the Kentucky Folk Art Center and President of the Ohio Folk Art Association. We love both old and new. Folk art blends history and culture with design and emotion. PAINTED FURNITURE/UNIQUE PAINTED WEARABLES- Linda is back at the easel. Mostly with impressionist wearable's for the lady with a special style. 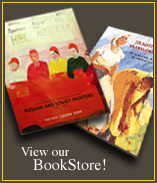 How Should I Collect Russian Art?